Moisturise the skin after a dry or wet shave with our super hydrating balm, packed with soothing herbs to nourish delicate or irritated skin. The good stuff: Sweet Almond Oil infused with Mint, Shea Butter, Coconut Virgin Oil, Cocoa Butter, Arnica Infused Oil, Candelilla Wax, Natural Vitamin E, Essential Oils (Yarrow in jojoba oil, Palmarosa, Roman Chamomile in jojoba oil). Use me: After shaving, using your fingertips, take a small amount and apply to your neck, chin and face (avoid the eye area). 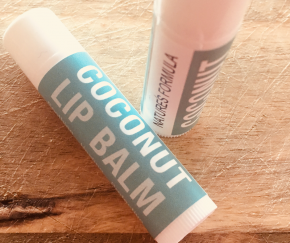 Tip – for a super cooling effect keep the balm in the fridge. For most skin types. Gently removes impurities & make up, leaving the skin hydrated. Ingredients: Purified water, Jojoba oil, Vegetable wax, Grapefruit seed extract, Orange, Tea tree and Sage essential oils. 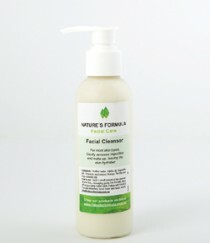 How to use: Apply a small amount of the cleanser on your face,massaging gently into the skin. 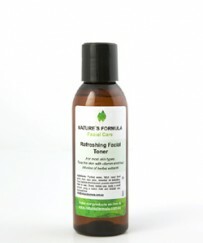 Wipe off using a damp cotton cloth.Follow with Nature's Formula refreshing facial toner and facial serum. 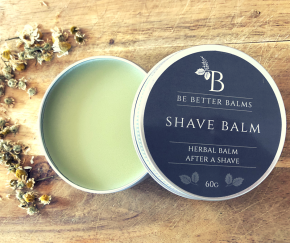 Ingredients: Purified water, Jojoba beads, Jojoba oil, Vegetable wax, Grapefruit seed extract, Orange, Tea tree, Sage and Ylang Ylang essential oils. How to use: On damp face gently apply a small amount of the skinbuff. Massage using very light circular motions for one minute. Rinsewith warm water. Follow with Nature's Formula toner and Serum. Ingredients: Purified water, Avocado oil, Glycerine, Vegetable wax,Wheat Germ oil, French Green Clay, Grapefruit Seed Extract, Patchouliessential oil. How to use: Take time out to luxuriate in this nourishing mask.Apply a thick layer of the mask over your face and neck (avoid the eyearea). Leave the mask on for 15 minutes. Rinse with lukewarm water.Follow with Nature's Formula Toner and Serum. A concentrated blend of plant oils to seal in moisture and intensively nourish the skin. 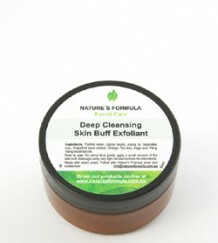 Ingredients: Jojoba oil, Avocado oil, Rosehip oil, Patchouli, Geranium and Neroli essential oils. How to use: One pump is all you need! Then pat and press onto your face and neck to nourish and hydrate. Use morning and night as a moisturiser or before moisturising. 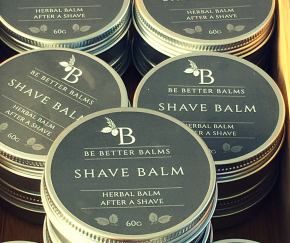 Ingredients: Jojoba oil, Avocado oil, Rosehip oil, French Lavender, Geranium and Ylang Ylang essential oils. Ingredients: Jojoba oil, Avocado oil, Rosehip oil, Rose Damask absolute, Geranium and Patchouli essential oils. How to use: Shake before use. Apply a small amount using a cotton cloth and smooth over cleansed face. Ingredients: Coconut oil, Shea Butter, Calendula Infused oil, Jojoba oil, Beeswax, Grapefruit seed extract, Lavender essential oil. Deeply hydrate your facial skin with this nourishing cream. Suitable for most skin types. 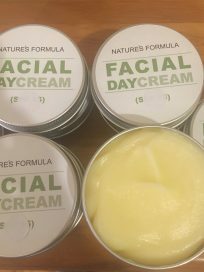 Ingredients: Purified water, Jojoba oil, Vegetable wax, Glycerine, Calendula infused oil, Grapefruit seed extract, Rosehip oil, Essential oils (Ylang Ylang, Lemon myrtle, Patchouli, Carrot seed).